The 7×7 Shire Barclay Corner Summerhouse is a very modern and stylish corner summer house. This is for those who want something that has a very cool and sleek design. The size of this summerhouse means that even more modest and compact sized gardens will be able to handle this. It has a very smooth design and it is always going to be inviting you inside thanks to those large windows and the set of double doors. A very smartly designed pent roof just finishes the summerhouse off perfectly. If you want a compact sized place to relax that has a real stylish look then this is the summerhouse for you. 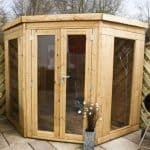 Even though this is a very fairly priced summerhouse, it is still made with some very impressive materials. The walls are made with 12 mm thick tongue and groove shiplap cladding. The walls are backed up with a 34 mm x 34 mm frame, which at the price range is just incredible. To ensure you can put many heavy items inside or just enjoy a good dancing session after a few drinks, a strong, tongue and groove flooring has been used. From top to bottom this is a corner summer house that is very impressive. Here we have the awesome looking 7×7 Shire Barclay Corner Summerhouse. We just love the style of this corner summer house and feel that the modern design of it makes it stand out from the more classic looking summerhouses. It is like Shire have gone for a somewhat pool/party house kind of look and they have certainly pulled it off in our opinion. 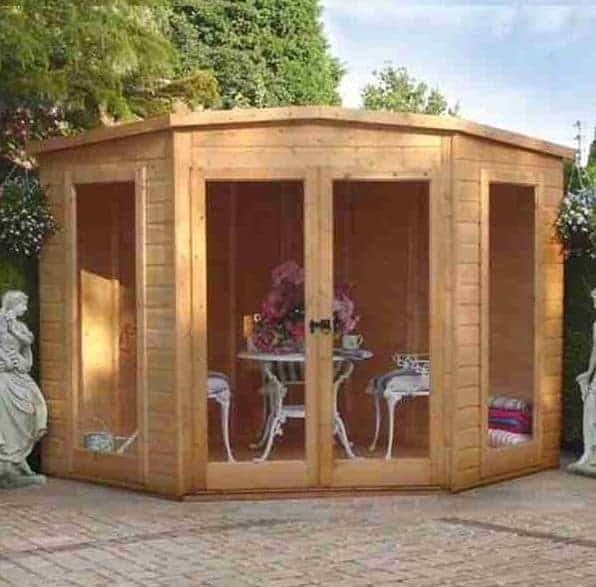 This is actually a compact summerhouse so it is just ideal for those who do not have a large garden or those who just do not want a summerhouse taking up a ton of space in their garden. The width and the depth of the structure is 6 feet 9 inches, so you are going to have to plan your layout smartly. Still despite this compact size, a couple of chairs, a table and even a cooler full of cold beer could fit in here. The headroom is something that surprised us as it is stands at 7 feet 1 at its highest point and then at the eaves it is still a respectable 6 feet 7 inches. The roof is very well done and the official description of it says that it is a pent roof. Which we would have to agree with, but if you look very closely you can see that it does actually raise up a little bit in the middle which gives it a very nice effect. 11 mm thick solid sheet boarding is used for the roof and this is then covered by felt to give it protection from the rain. We really like the overall style of the roof and the small almost understated overhang just finishes it off perfectly. The 7×7 Shire Barclay Corner Summerhouse is a truly gorgeous looking corner summer house and this is achieved with the smooth tongue and groove shiplap cladding they have used. We really like this cladding as it gives the summerhouse just such a great style that if you are in the garden it will always be trying to tempt you to come and sit down for a few minutes. This cladding, as well as being very easy on the eyes, is 12 mm thick so it is also very strong and due to its design will keep the rain out incredibly well. 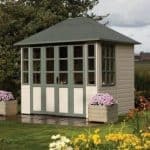 Before we started this review we would have put money on there being a standard 28 mm x 28 mm frame inside the summerhouse. Well we would have lost because there is a thick and solid, 34 mm x 34 mm frame keeping the structure together. At this price having a frame this strong and thick really is surprising. The frame is going to ensure this summerhouse stays strong for many, many years. We were a little, not worried let’s just say concerned, that the floors would be made with the same solid sheet boarding as the roof. But they have gone that extra mile and used tongue and groove boarding for the floor. From a pure vanity point of view, these boards look great and go very well with the walls. Also at 12 mm thick they are able to take a ton of weight so you will have no worries about putting heavier items inside of here. The only thing with using this kind of boarding is that it does make you wish they used tongue and groove boarding for the roof as well. They make a pretty big deal about how their 7×7 Shire Barclay Corner Summerhouse comes with a free dip treatment. This really is not all that special as you are still going to have to give it a coating of wood treatment fairly soon after installation and also on an annual basis after this. 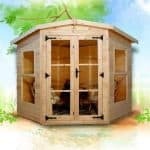 This is a very well made corner summer house so we do not see you having any problems with it, but if you do need to make use of the warranty then you will have to get in touch with them as there is no indication of what the warranty is. Now we have dealt with Shire before and most of the time they seem to offer a 5 or 10 year warranty, but it is still best to double check what the warranty is in this case. Located right on the front, the large double doors are a major feature of the summerhouse. Mainly made with styrene windows, these doors have some very smart looking framing, modern fixtures and are a very good size. The door is 4 feet 6 inches wide and 5 feet 9 inches high so getting in and out even with a glass of your finest wine in your hand is no trouble at all. On the sides of the summerhouse there are another two styrene windows. These are made with the same styrene as the ones on the door and they are a very large size. We really like the design of these windows and feel that making them fixed was the right decision. If you do want fresh air in the summerhouse, then you can still crank those large double doors wide open. If you take a look at the picture, you can see that there is a very good looking latch closing mechanism on this corner summer house. We actually really like this, but it does mean that you will have to add some kind of lock to the 7×7 Shire Barclay Corner Summerhouse. If you want to give it some extra security, something like a pad bolt and padlock would be the easiest way to do this. We must way while we feel the latch goes very well with the design of the summerhouse, we think they could have put an actual lock on here. As the front and the sides are mainly made up with windows, you really will not want to be strutting around in here with just your birthday suit on. It is not really offering much in the way of privacy at all. But we think this is part of the charm of its design and if you are worried about privacy or just want it to look cosier in the winter, then consider adding in some curtains or even blinds. Shire are offering no customisation options at all with this corner summer house. But as you will need to treat the wood, one way that you could give it a little bit of customisation is with a wood treatment that is coloured. The 7×7 Shire Barclay Corner Summerhouse is not trying to get more money out of you with extras. They are not actually offering any at all! But we do recommend that you pick up at the very least a padlock so you can securely keep those doors closed. You can get a padlock for as little as a pound these days, so it is not a big expense at all. This is one very well made summerhouse and the fact that it is being sold for the price it is makes it even more attractive. This is going to last you many, many years. The structure is very robust and will easily last a couple of decades. The wood though will need to be looked after by you so do not forget its annual coating of wood treatment. This is one of the smaller summerhouses we have seen. But as far as compact summerhouses go, you still can make the space go far if you plan it out just right. The compact nature of it does actually mean that even those with smaller gardens are going to be able to enjoy it. You are not going to have any major hassles putting this together. With the help of a friend who is not a slacker, you are looking at 6-8 hours at the very most. For the most part this is a very simple DIY job, so do not worry. At under £500 this is just incredible value for money! 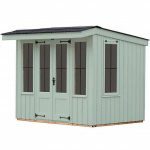 Final Thoughts: The 7x7 Shire Barclay Corner Summerhouse is one of the best value compact summerhouses we have seen in quite some time. While it is easy to think we are saying this because of the price, the fact is this is made with fantastic materials such as the tongue and groove walls and floor, high quality frame and styrene windows, it actually could be priced another £150 more expensive and we would still say it was a great deal. 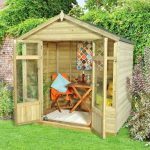 The modern design of this corner summer house really does make it eye catching and we are sure that everyone who purchases it is going to love the way it looks in their garden. 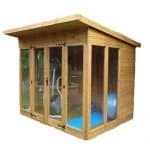 At this price and this quality, we find it very, very easy to recommend this summerhouse.